The live interactive app can be found here: https://sflscientific.shinyapps.io/employee_attrition_app/ (Please contact mluk@sflscientific.com if you have trouble viewing this page). This is third in a series of blogs that will discuss the results of our RShiny Attrition App. In this part, we use the results from our pre-trained models in Part 2 to do some model evaluations and discuss the results. We will use several machine learning criterions such as receiver operating characteristic (roc) curve, precision and recall curve, etc. All of them are calculated based on the predicted attrition class and the true attrition class in the testing dataset. Remember that each algorithm gives a confidence score(probability) between 0 and 1 for each employee, indicating that these individuals are somewhere between 0% and 100% likely to attrite, respectively. By setting the confidence score threshold, above which we predict an employee to leave, we end up with a control on the precision and recall statistics. The cutoff can be adjusted in real-time, in the RShiny app, to optimize the model based on the needs of the business. A receiver operating characteristic (ROC) curve is the result of plotting the true positive rate against the false positive rate. The closer the ROC curve is to the top left corner, the greater the accuracy of the test. Let us create a simple prediction object and use them to create roc plot. Everything is set up and we could draw an awesome roc plot now. The plot above indicates that the performance of the three different machine learning models are roughly the same. 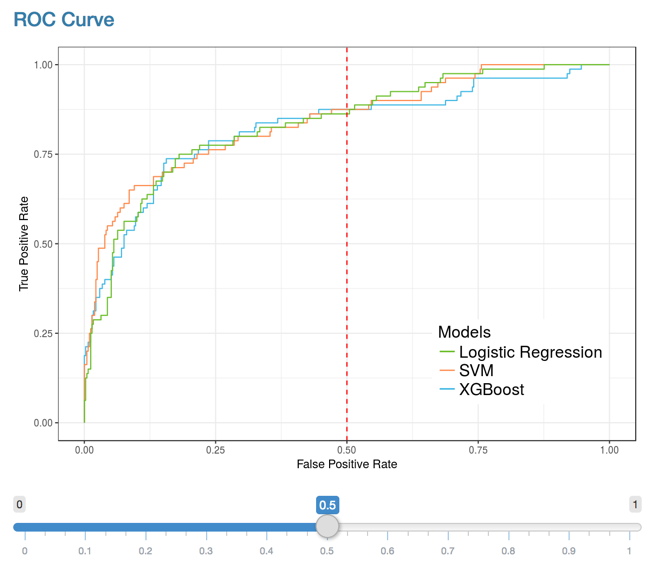 Slight variations show that if the false positive rate is above 0.6 then SVM and logistic regression seem marginally better than the XGBoost model. We have also added a slider to adjust the vertical red line in the Shiny app. The slider allows the user to change the operation point of the algorithm by setting the false positive rate. The changes made to this cut-off are reflected in the confusion matrices. Define get_cutoff_point function to obtain the cutoff probability given a fixed fpr. Any predicted probability that is greater than the cutoff will be classified as attrition and vise versa. Define draw_confusion_matrix function to draw a confusion matrix plot given calculated confusion table, auc and chosen color. Take a look of three confusion matrices from three models and compare their auc, fpr,tpr and accuracy. # threshold = 0.5 just for illustration. The confusion matrix show the predicted and true attrition numbers of employees. For example, the XGBoost matrix shows that of the 410 employees that do not attrite, our model predicts 227 true negatives, and 183 false negatives, similarly out of they 80 true attrites, 69 are correctly labelled as attitioners, with 11 false negatives. Another way to visualize this result is to look at precision and recall. Again, by controlling the cutoff, we can compare precision and recall values among different models in this plot. Shows the tradeoff between precision as you increase the cut-off. Shows the tradeoff between recall as you increase the cut-off. The above figures show the Precision and Recall curves for the three models and illustrate how the cut-off will affect the precision and recall. Here, we use cutoff = 0.5 as a default in our Shiny App. The user can adjust the cutoff slider by themselves. As with the ROC curve, the confusion matrices for each algorithm are updated with changes to the slider location. With these results, we can give the HR department a list of the employees that are the most likely to leave, as well as the confidence score returned by the model. Further, the confidence score can be combined with any HR metrics, which themselves can be modelled algorithmically if need-be, to give an expected value lost per individual. For more details on this or any potential analyses, please visit us at http://sflscientific.com or contact mluk@sflscientific.com.